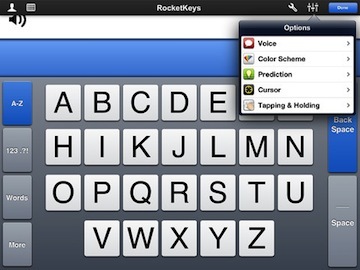 KType is now RocketKeys, part of the MyVoice family of incredibly easy-to-use accessibility apps. 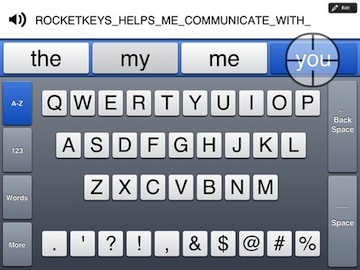 MyVoice Inc. makes life-changing aids for people with speech and language disabilities. MyVoice's innovative apps for iPad, iPhone, and iPod touch are pioneering new technologies while also being among the most affordable products of their kind. Today, MyVoice products provide a voice for thousands of users around the world. KType is a research project by Chirag Mehta with the goal of improving communication for individuals with speech & motor disabilities. The KType for iPad app, now powering as the RocketKeys app, is the first product developed with insights gained from colloquial conversation analysis, optimal keyboard design, input handling issues, and working with users with speech and motor-control disabilities. Copyright© 2010-2019 Chirag Mehta. All Rights Reserved.